Are you wondering why God won’t answer a particular prayer of yours? My how we hate the silence, and yet God does some of His best work in the quiet. 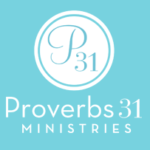 1) God is under no obligation to bless anything that is not surrendered to Him. If you want Him to bless you financially, you need to be honoring Him first with all that you have (Malachi 3:10) and being a good steward of what He has given you (2 Corinthians 9:6-8). If you want God to bless your marriage, you need to surrender your marriage to Him and be obedient to His instructions on marriage (Ephesians 5:21-33). If you want God to bless your children, you need to surrender those children to Him and not try to control every aspect of their lives as if those kids were yours. Are you following? Believe me, these are reminders to myself, as well. 2) God is not bound to perform within our timeline. God is eternal. That means His idea of time is different than yours and mine. God may choose to wait a whopping 10 years to give you something. For you and me, that seems like an eternity. To God, it is just a blink in time. Yet, His timing for your life is perfect (Deuteronomy 32:4). So be patient. : ) Sometimes God’s work is in the eternal realm where you can’t see it. Trust that what He does is in the scope of the billions of consequences and details that He is ever aware of and that you may never be able to see this side of heaven. 3) God may be testing your faithfulness in the silence. Clearly, we can handle God’s power, but not His silence. Yet, God does some of His best work in the quiet. In Exodus 24, the Israelites saw a grand, powerful, terrifying demonstration of God. As He came near Mt. Sinai they heard the thundering, saw the flashing lightning and felt the earth quaking. God was real. And He was for them. How wonderfully exciting! Yet just 40 days later, those same people who saw God do mighty things felt it was “so long” since they’d seen or heard anything from God that they wanted a new god. So they gave all their gold jewelry to Moses’ brother, Aaron, and asked him to make them a god they could see right in front of them. How absurd! And yet we do the same thing, don’t we? We praise Him when we see His mighty works (and answers to prayer) and we doubt Him in the silence. During those 40 silent days when the people hadn’t heard from God, He was carving His law on tablets of stone. He was on the mountaintop making a covenant with His people. But His people were down in the valley too anxious for results to wait and experience the glory of God. The God who showed Himself to you mightily at one time is still just as powerful in the stillness. Respect His right to be silent. Trust Him in the quiet. Perhaps it is that God — who does wonders in the silence — that you need to get to know a little better before He grants you your heart’s desire. Sometimes God’s refusal to answer is His way of keeping you close by — still asking, still waiting, still relying on Him. Show Him that He can trust you to be faithful even in the silence. Even in the uncertainty. Even in the dark. Have you experienced a dark or silent time in which you later found out God really was at work on your behalf? I’d love to hear it in the comment section below. on Why Won’t God Answer My Prayer?. I have been going through a period of silence for the past two years. He has spoken to me now and then but its been different from when he used to speak to me frequently and I have to admit I missed that immensely. I was loving it and enjoying him and asked him why are you more silent lets just keep talking back and forth. I found it odd and difficult to accept encouraging words about why God is sometimes silent. But I now realize that he is with me always and its easy to lose sight of that fact and he is watching and yes maybe testing me to see if I’ll hold on and still talk to him. There were many times I felt ignored by God — where are you? I would literally ask him in prayer deep down knowing he was with me, have you got bored of talking to me? I would ponder this in my heart. The scriptures about trust would start to come up after my prayer its been happening a lot this year either in a picture a car sales company’s head board also had the word trust on it. I prayed whilst in the taxi going to my destination and as I opened my eyes that is what I saw — TRUST in big bold letters across a car place’s headboard. I saw it again that day on a Boots pharmacy bag TRUST; I saw it that same day at work on the nursery’s work chart TRUST in italic lettering and TRUST on the nursery’s toilet bin! lol. So I am working on that with God right now fully and completely obliterating doubts by trusting him. I believe God is teaching me to take him at his word and that at age 28 (29 in April) I dont have to worry about my biological clock ticking (as I tend to do) or what my future holds. I say this statement a lot now ‘whether I marry or not my lifes purpose is bigger than marriage, than having babies, or a cute picket fence house, or that dream job. My purpose is to reach the lost and honour God with my life. I hope this encourages any women who is in need of it. Know you’re not alone and that God is ALWAYS with you, he NEVER forgets you and he loves you DEEPLY. Thank you, Becca, for those precious words. 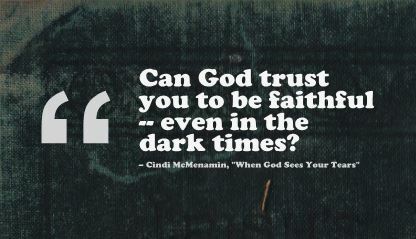 I love the way God keeps reaffirming to you to “TRUST.” He does have a sense of humor, doesn’t He? Thanks for reading and I hope to continue to hear from you. Thank you, Chery. And thanks for your input.